Silverstone, home of British motorsport, plays host next weekend (30/31 May) to the Milltek Sport Volkswagen Racing Cup and, with the season set to reach its mid-point at the famous British Grand Prix circuit, the stakes are getting high for those hoping to set out their claim to the championship title. Just 44 points separates the top six in the standings, and the addition of a ‘wild card’ entry is set to make Silverstone even more exciting. Thanks to a brace of race wins at Oulton Park last month and a further victory in early May at Rockingham, it is 25-year-old Rotherham racer David Sutton who maintains the championship lead, but the SlideSports Scirocco driver is only 18 points ahead of 2013 champion Aaron Mason. 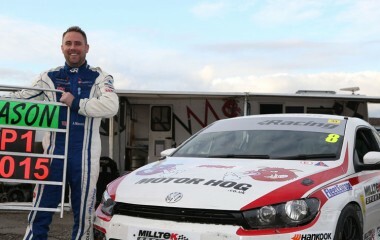 AWM Scirocco pilot Mason, 35 and from Doncaster, has won more VW Cup races (20) than any other driver, but despite being a frequent podium visitor has yet to add to his tally in 2015. Both Sutton and Mason will have to keep an eye open at Silverstone for 27-year-old Irish rally star Robert Barrable, who is to return to the series after enjoying a winning debut at Donington at the end of last season. 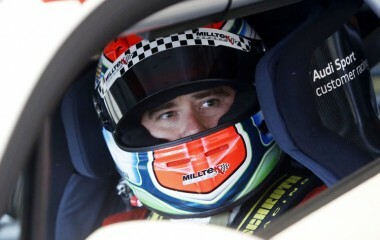 As at Donington he will drive THM Racing’s Golf GTI. “I’m all ready for action,” said Robert, “and looking forward to coming back at Silverstone. Obviously the hope is to pick up where we left off, and to enjoy myself and hopefully get a good couple of results. I haven’t had any testing – the last time I drove the Golf was at Donington and the next time I drive it will be the Silverstone test day before the race – but I’m hoping to enjoy it and it will be good to try the Grand Prix circuit.” Barrable’s previous Silverstone experience is of the National circuit, on which he raced to second place in the 2009 Formula Ford Walter Hayes Trophy. Jack Walker-Tully (Cooke and Mason Scirocco) will be eyeing the top step of the podium at Silverstone after breaking his duck in style at Rockingham, where he scored runaway wins in both wet and dry conditions. Jack scored his first podium finish at Silverstone in 2014 (as did Lucas Orrock), with Mason and his Safe and Sound team-mate Joe Fulbrook taking the victories. Reigning champion Fulbrook, Mason’s closest all-time-wins challenger with 16, is another yet to have tasted the victory champagne this season, although two seconds at Rockingham hint that it will not be long before the Golf GTI driver does. “We are still learning about the car,” said Joe, “and coping with problems. 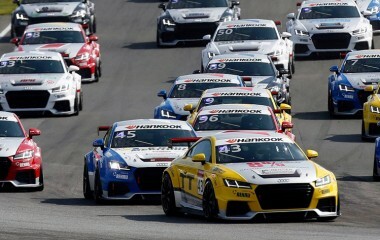 We switched to the TFSI engine this year and that has caused problems, but we are ironing them out now. We have suffered a bit from a lack of straight-line speed, and we need to look at getting the tyres to ‘switch on’ a bit sooner, but we won at Silverstone last year and had a good battle with Aaron, so I am hoping for a good race or two. A third and two fourths is not the score that KPM driver Lucas Orrock would have liked to have amassed by this stage in the season, and he will be hoping that Silverstone’s two races – as opposed to the triple-headers seen at Oulton and Rockingham – will be kinder on his Milltek Sport and Vindis-backed Scirocco’s tyres and help him back on to the podium. 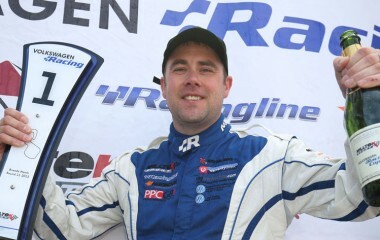 Just behind Orrock in the standings is Joe McMillan, a winner at Oulton and a podium finisher at Rockingham. 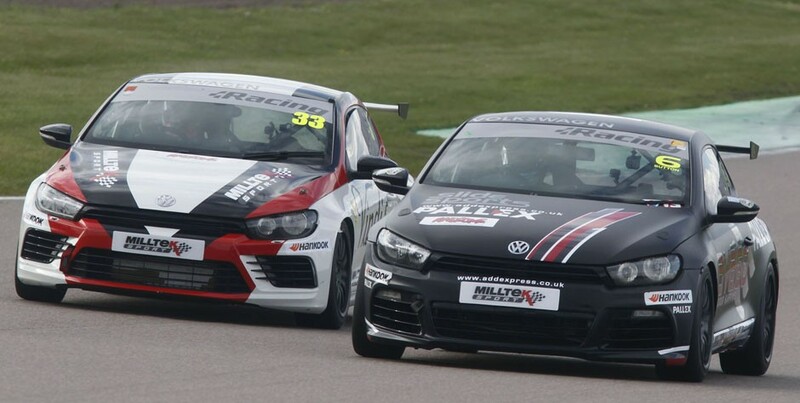 Joe’s Cobra Engineering Scirocco will be running free from success ballast in the first race at Silverstone while Walker-Tully’s and Mason’s will each have an additional 60kg on board, with Sutton on 40kg, Fulbrook on 32kg and Orrock with 24kg. The Team HARD trio of Howard Fuller, Bobby Thompson and Michael Epps – respectively seventh, ninth and 10th in the championship – will by vying with Fulbrook and Barrable for the honour of scoring the first Golf GTI victory of the 2015 season. A 27-car field is anticipated at Silverstone, where Sunday’s two races support the three-hour British GT Championship Silverstone 500. The event-closing VW Cup finale is scheduled to be screened live across Europe on Motors TV.